‘Ring’ is designed to be worn on the index finger, with motion sensors within the Ring it can identify gestures being made by the finger. 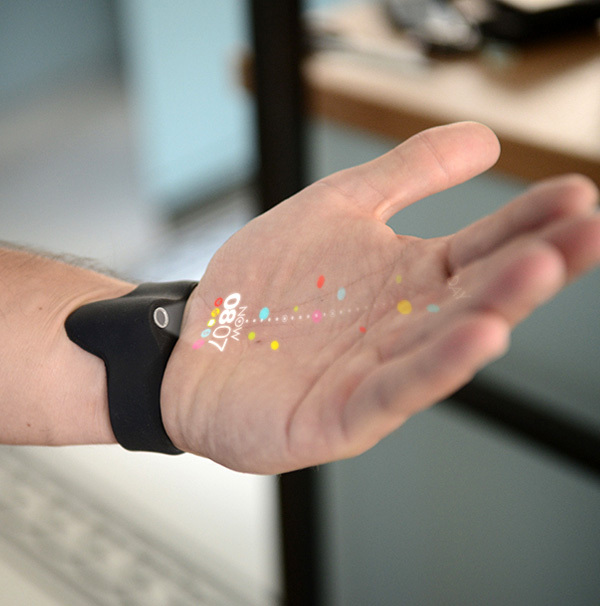 The wearer can make motions to control paired devices; even writing letters in the air to compose text messages. Using GPS and Apple’s iBeacon technology, the Ring can also be used to make payments in shops and restaurants with a tick gesture. 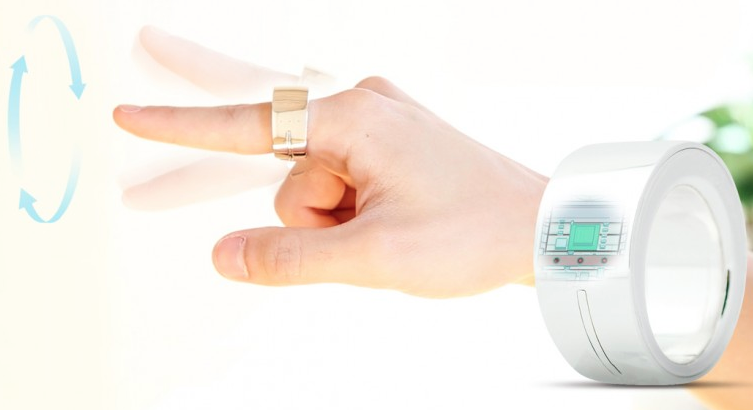 Ring is linked with an app which has pre-installed gestures in its memory, there is also the option for the wearer to customise gestures; training the ring to recognise a user’s own air handwriting. 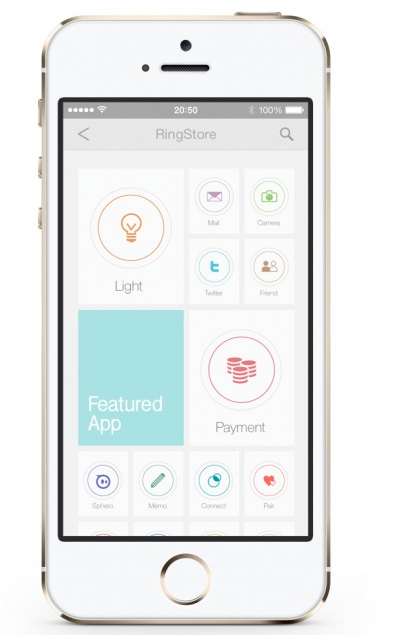 ‘Ring’ has similar characteristics as to the iPhone application created by OneLlama which we have previously looked at this month; it is becoming common to find applications that allow the user to adjust the system, tailoring it for themselves. 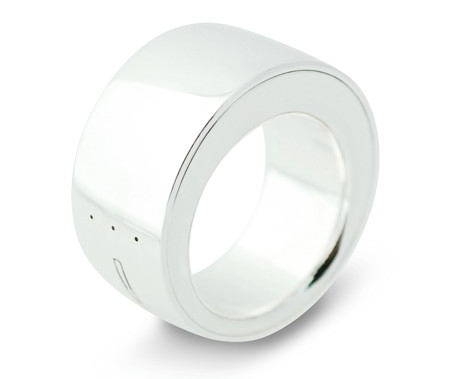 Additionally the wearer can be notified by the Ring via LEDs or a vibration pad embedded in the device. This is the option that interests me the most. 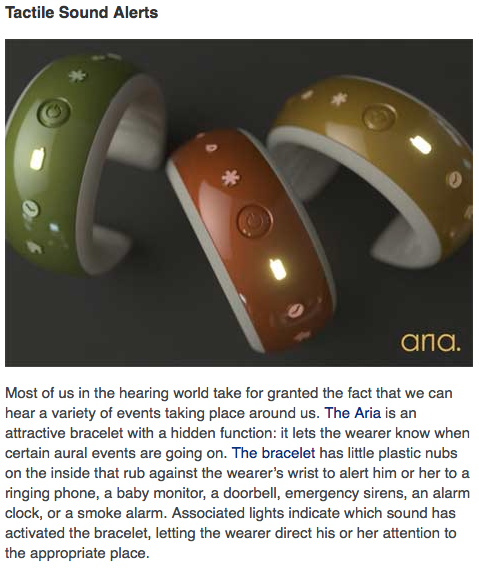 It has not be clear as to what it notifies the wearer of…. but it would be great if the ring would alert the wearer of incoming calls or texts or any other activity happening on the phone. 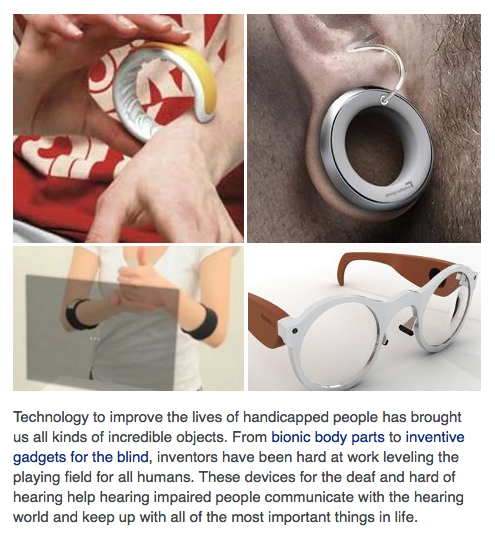 This particular service would be beneficial for deaf and hard of hearing, allowing for additional vibrations closer to the body to alert the wearer. Its creators say Ring has been tested with iPhone, iPad, Android, PC, Google Glass, smart watches, home automation devices, and web services including Twitter, Facebook and Evernote. The company says smart devices can also serve as a hub to allow the ring to control devices that rely on Wi-Fi rather than Bluetooth connectivity. 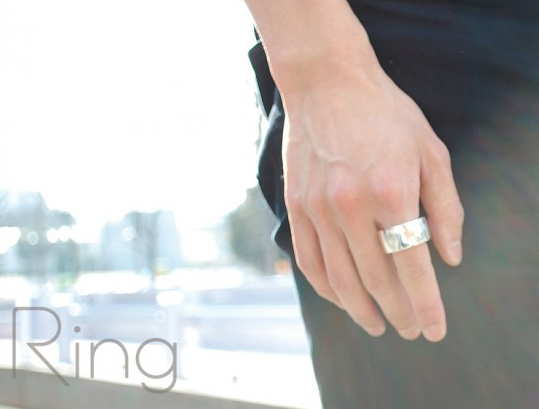 Currently ‘Ring’ is on Kickstarter, raising funds to get Ring into production with the hope being to begin shipping the device from July this year. The initial batch will only come in silver, but different sizes will be available. The US$145 pledge level to reserve a Ring has already been filled, leaving $165 as the cheapest tier to stake a claim for the device. What are your thoughts on wearing jewellery linked to technology? Have a look on Kickstarter to watch the promotional video for ‘Ring’ or to show your support. The new AllSee system developed at the University of Washington (UW) detects gestures and translates these into specific commands. 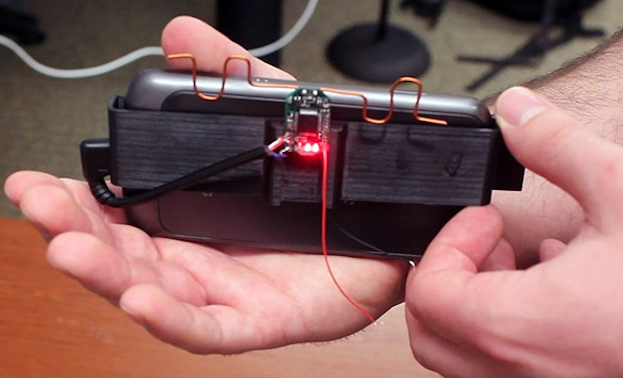 This prototype doesn’t use a device’s camera, nor do you have to take your phone from your pocket or bag to make it work; tucked out of sight the system uses electromagnetic waves from wireless transmissions. 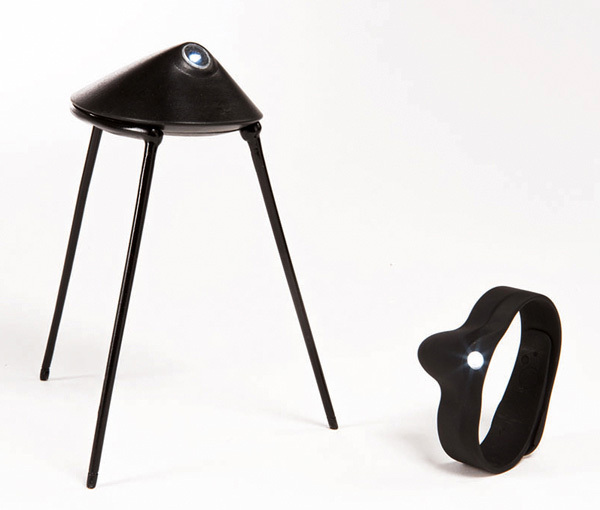 Currently the prototype can correctly identify the hand gestures from more than 2 ft (60 cm) away from the sensor. These gestures include pushing and pulling to zoom in and out and raising and lowering the hand, to alter the volume of music for example. The low power requirements of the system provide the possibility of the technology being always on without draining the battery of the device. The UW team have also designed a wake-up gesture to ensure unintentional gestures don’t confuse the system. The UW researches say the AllSee system could also work with other household electronics, and are looking to further develop. 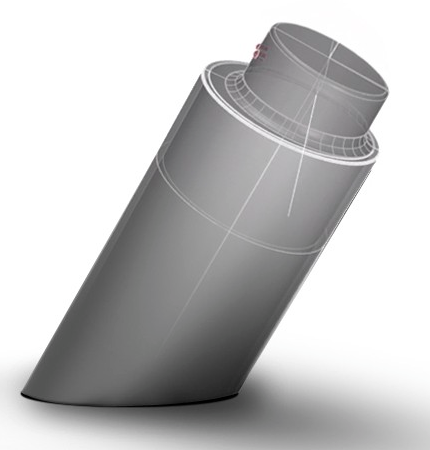 It can be seen from this video that the prototype is still at early stages. The recognition is impressive but still at this stage, limited. 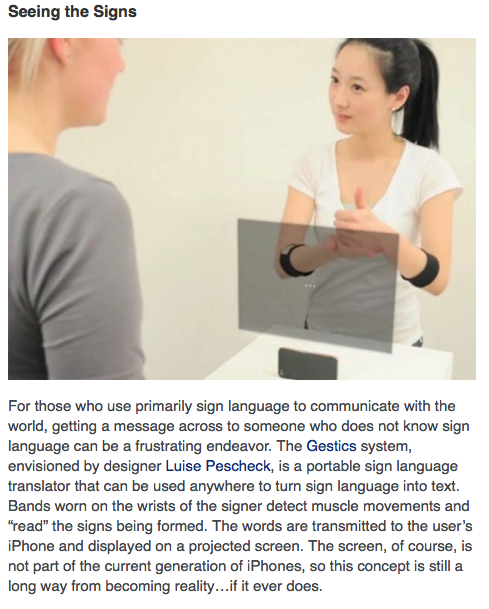 If gesture recognition improved we would begin to see how devices could learn to read sign language and translate into text or audible form. 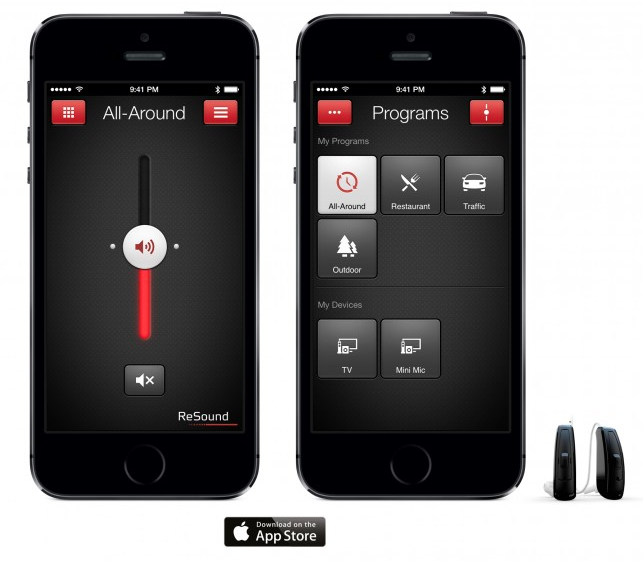 ‘ReSound LiNX’ hearing aid from ‘GN ReSound’ connects with a user’s iPhone, iPad or iPod linking tiny hearing aids to act as wireless stereo headphones. An application allows the user to control and personalise settings at different levels for preferred sounds. It can also use stored memory to automatically adjust to different surroundings, such as outdoors or pubs; places with louder frequencies. 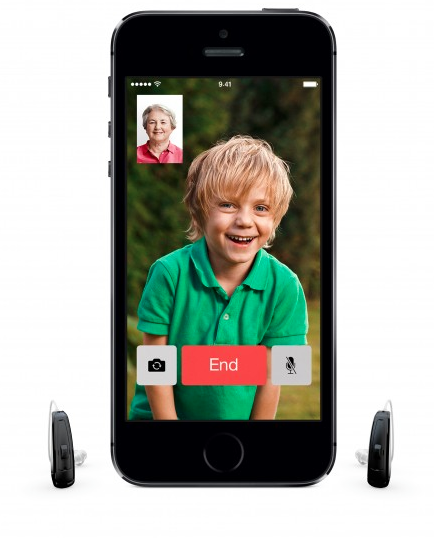 These hearing aids and the smart device application are for the use of those with hearing loss, they will not provide sufficient levels for profoundly deaf. 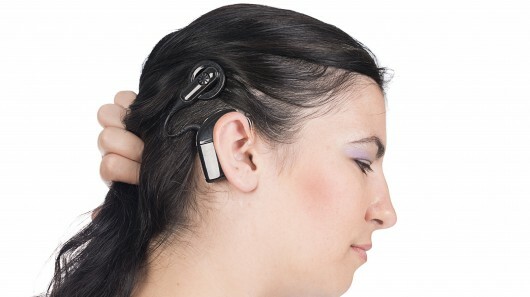 The company however quote the hearing aid itself is powerful enough to aid 90% of hearing loss cases. The subtitles for this video are quite disappointing, there are many errors which may make this video difficult to understand as the errors make the sentences nonsense. Apologies for this. For this promotional video the company have used elderly actors which I feel stereotypes the category “hearing loss”- not all people with hearing loss are grey haired and wrinkled. This may put off those likely to be interested in this device. A question came to mind when watching this video- What age category are they aiming for- the app/ iPhone generation or the “hearing loss generation” of which they advertise? It seems that there are mixed signals in this promotional video. Looking past some of the negatives, this idea of being able to adjust your hearing aid via your smart device is fantastic. As technology becomes integrated with our lives it is becoming more and more common for applications like this one to evolve. Would you like to see more of these developments? What changes would you make to this device? A startup called ‘One Llama‘ has created an app that is designed to alert a user when background noise is something that the user needs to know about, such as a car horn. 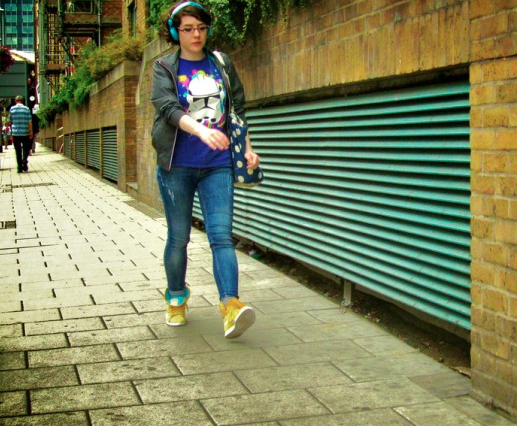 This has been designed for those who like to walk around a busy city with headphones, however it would be perfect for those deaf and hard of hearing. 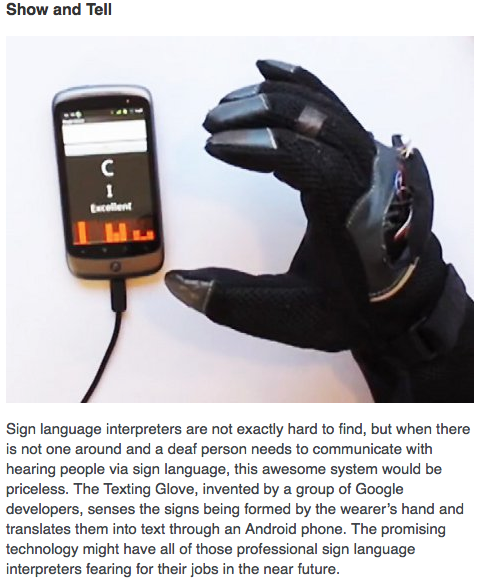 This is another example of how app development can be used to enhance the quality of life for deaf and hard of hearing. This new venture from One Llama does not actually feature any hardware. 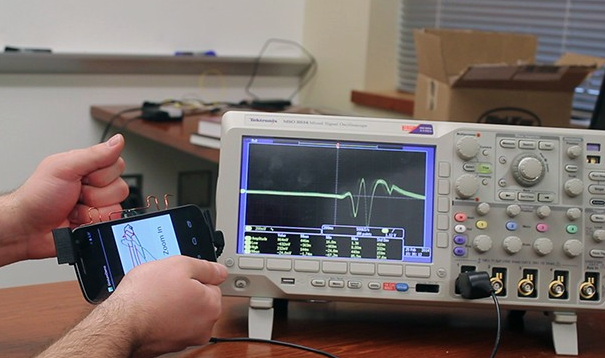 Instead, it will simply use the microphone on the Android device along with the processing offered through to app to analyze the noise flowing in the world around the user. It is thought this app should be released sometime this month (March). The app will be free, with a predicted added cost to each additional function you require. 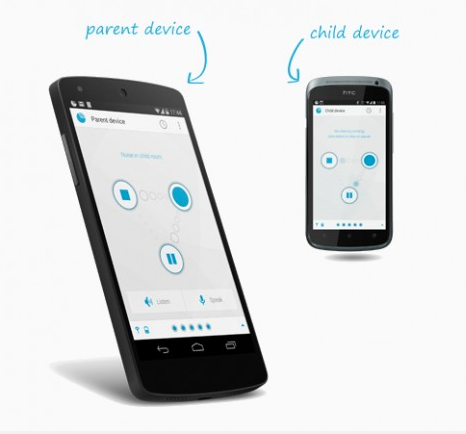 ‘Dormi‘ is an app that replaces the need for a separate baby monitor, and instead uses two Android devices. This app is perfect for those with two Android phones, but not ideal. 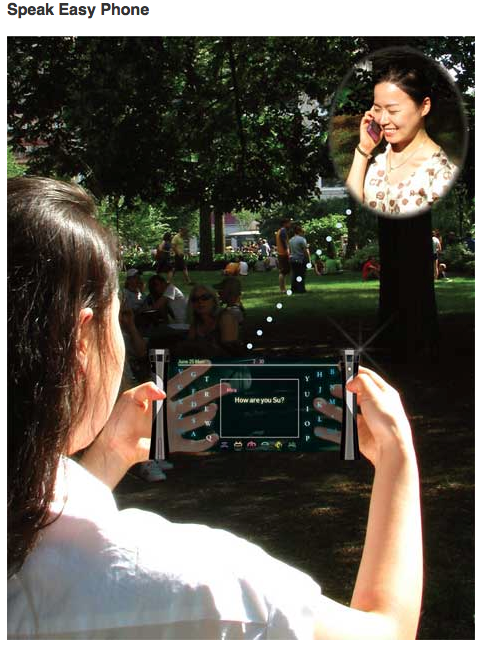 One device acts as a transmitter that captures audio, and relays it to the second device which acts as the receiver. Dormi can be used to speak to your child from the other side of the world. It does not rely on internet connection but can be used on Wi-Fi or mobile data. The “child device” can be positioned anywhere in the room along side the baby, it works automatically adjusting the microphone to pick up any noise being made. 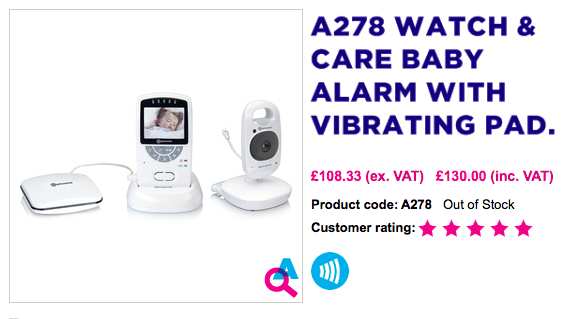 As sound is detected the “parent device” is alerted and gives the option of ‘push-to-talk’ to comfort their baby from afar. Dormi is free to use for four hours every month, but requires a paid subscription for use beyond that. App developments are creating better accessibility in many areas for more people. They allow for faster methods of ordering food, quicker payments for clothing and planning travel easier. Would you like to see a deaf friendly baby monitor app? 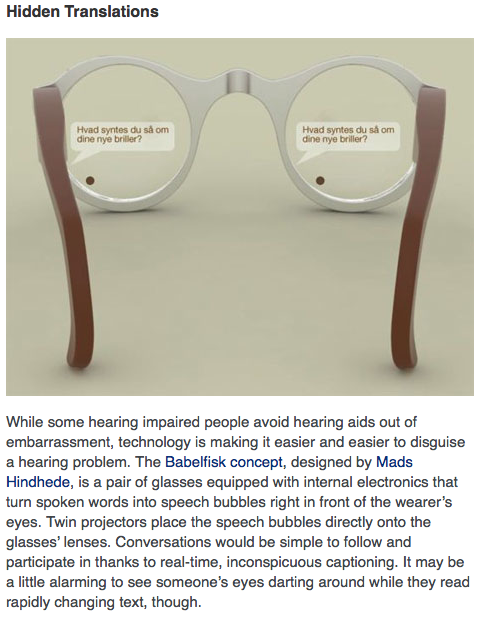 Below are 8 technologies designed for deaf and hard of hearing users. Once you have looked at all 8 of the options choose one which you would most likely buy and use. If you are brave enough comment as to why you chose it. 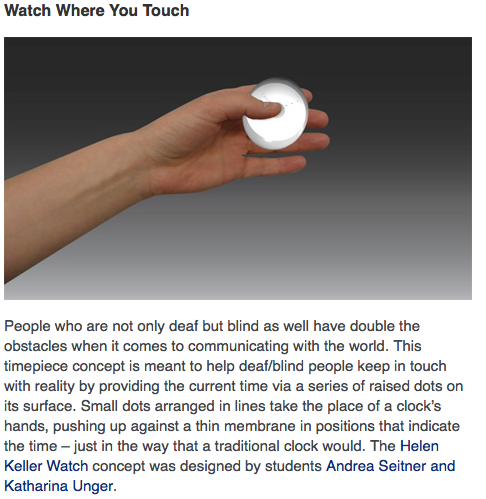 The watch projection is something I wouldn’t mind wearing, it doesn’t appear ‘in your face’ and can be quickly looked at without having to bring anything out of your pocket- i.e smart phone. Imagine out for a run and needing directions- could this be the perfect idea for a map? 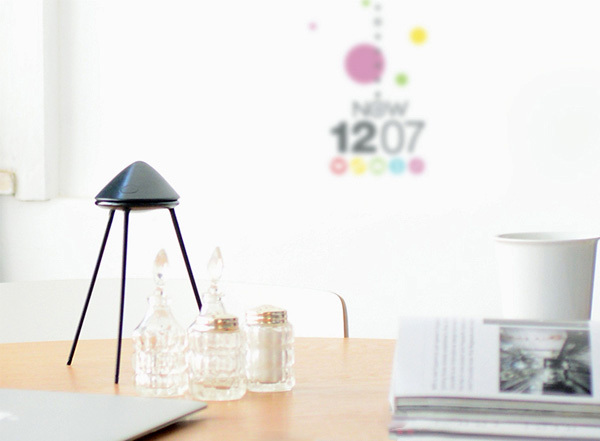 The wall projection would work well in many different surroundings such as school class rooms, work meetings, homes, and personal use. 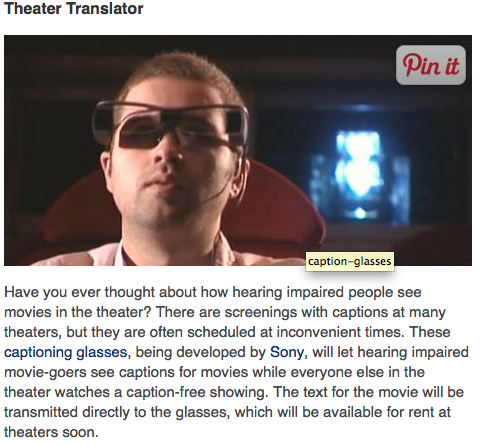 Projection at this scale and with this accessibility, at a personal level, opens up many opportunities that could be tailored for the deaf community. What would it be like to project a real- time signed interpretation on the wall or have Facetime and Skype calls projected in larger scale in front of you for a hands free option for sign language user? Yet again, another example of exciting possibilities for the future of technology. Researchers at MIT, Harvard Medical School and the Massachusetts have developed a chip that could lead to cochlear implants becoming entirely implanted. No more components… completely invisible. An interesting 2 sided discussion on having or not having a cochlear implant. Vikings first founded the island in 1000 A.D, in 1524 a second explorer from Italy landed and names the island Claudia. An English Man, Bartholomew was the third explorer to land, he named the island Martha’s Vineyard after his mother, and because there were plenty of grape vines on the land. Bartholomew settled the first colony on Martha’s Vineyard. 700yrs later a deaf settler, Jonathan Lambert made Martha’s Vineyard sign language (MVSL) evident across the island. Throughout the generations 2 out of every 4 children were born deaf. This lead to the island being half deaf and half hearing. Living together was easy as everyone knew sign language, their were no problems and no discriminations towards one another. Sign language was used by all, not solely for the deaf. 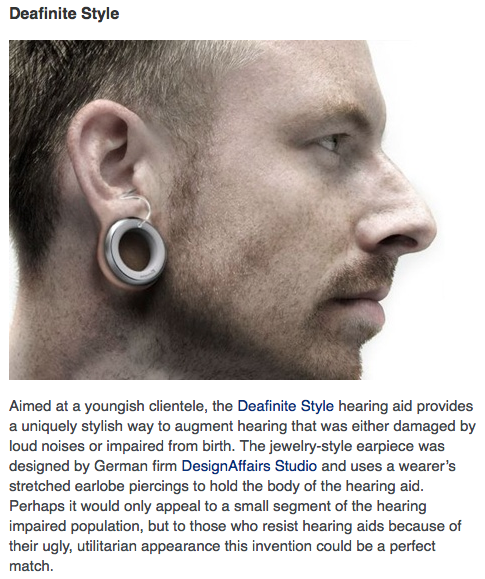 Being deaf wasn’t seen as a disability… it was simply a genetic difference such as eye or hair colour. Unfortunately today, Martha’s Vineyard is no longer a deaf utopia. Most of the deaf community have left, as family members moved to mainland for education. American School for the Deaf, in Hartford, Connecticut opened and many left the island. Teachers at this school were using French sign language and the students mainly used MVSL…. this eventually mixed to form modern American Sign Language, ASL. Deaf community began on mainland. America have Martha’s Vineyard to thank for their community and language, it has flourished into todays society and has helped make ASL a recognised language.